This project is now deprecated. For information on how this works, click here. Every day, thousands of tweets and dozens of news articles about the US Election hit the Internet. We can’t say for sure, but this is what the Internet is saying. 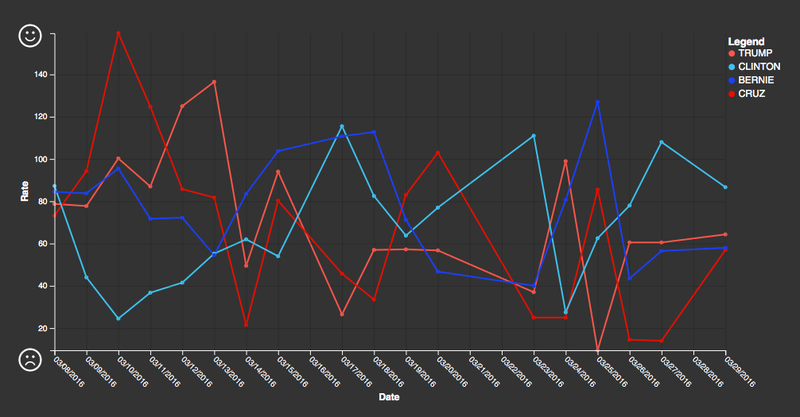 Every second, the WSO2 ESB collects tweets related to the US Election and the candidates running in it. As of the time of writing, that’s around 10 tweets a second - close to 0.8 million tweets a day. But which of these tweets are the most important right now? By considering the number of retweets and favourites a tweet earns, as well as its age, we’ve set up a system that ranks tweets according to popularity and slowly phases them out as they get older - most tweets are gone completely within 8 hours. This creates a list of the current top tweets in the election space. 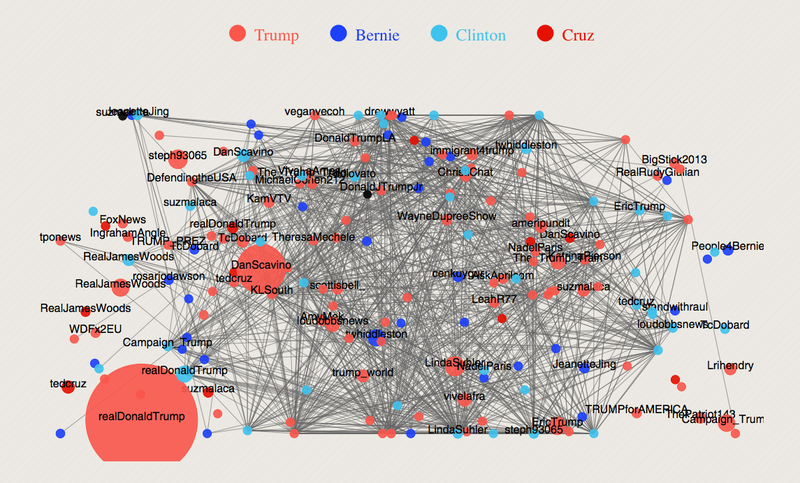 We know what the candidates are saying - what do their supporters talk about? The following word clouds show the most used words in each of these micro-communities. Note: John Kasich is not displayed here because Twitter activity on his hashtags is quite low relative to the rest of the candidates.This leads to his tweetspace being ignored by most of the algorithms. We’ve seen which tweets are the most popular. What happens to the people who create these tweets? How do they appear to the community? How does that drive party influence? To answer this question, we map Twitter by importance in real-time - each node is one of the most influential tweeps in the game, and each link is an interaction (e.g. retweets) between them. The larger nodes represent accounts getting the most amount of attention - lots of likes, lots of retweets. Their color defines who they vote for, or at least who they tweet about the most. This allows us to see who really drives this debate on Twitter. People in this community also share lot of links. When collected from a vast amount of data, these links often let us know what a sizeable chunk of the population thinks and feels. Historically, the media has shaped how people think - and, conversely, turned out to be a good indicator of public opinion. 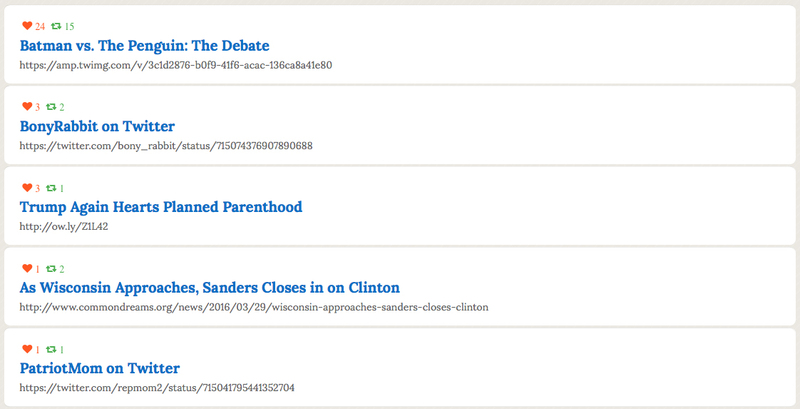 Here, we tap into Google News to find the most relevant news articles for candidates. We then analyze the sentiment therein, and map it across time. This allows us to see how sentiments changes over time as the debate rages back and forth, and candidates come up with more and more atrocious things to say.